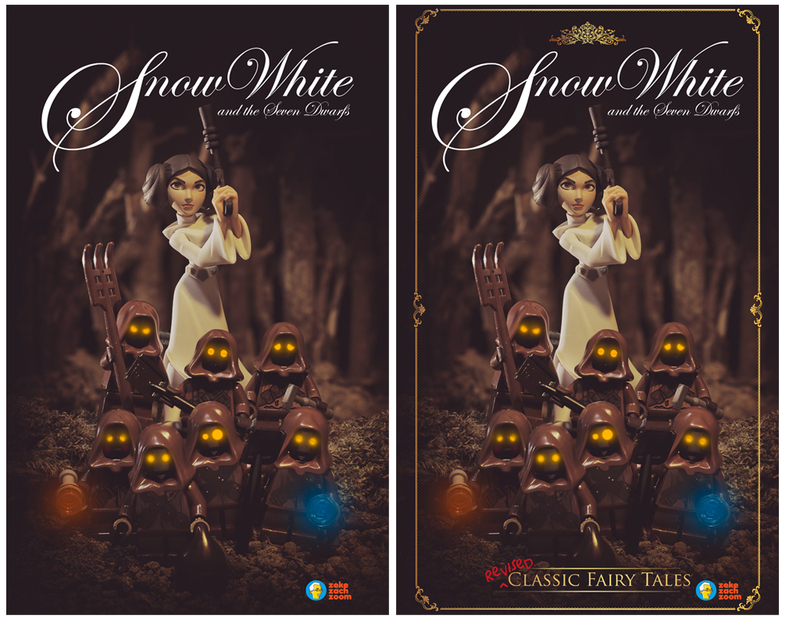 Thanks to the Google Plus toy community’s Literature themed photo challenge, I had a ball creating a bunch of alternative book covers for some fairy tales and classic literature. 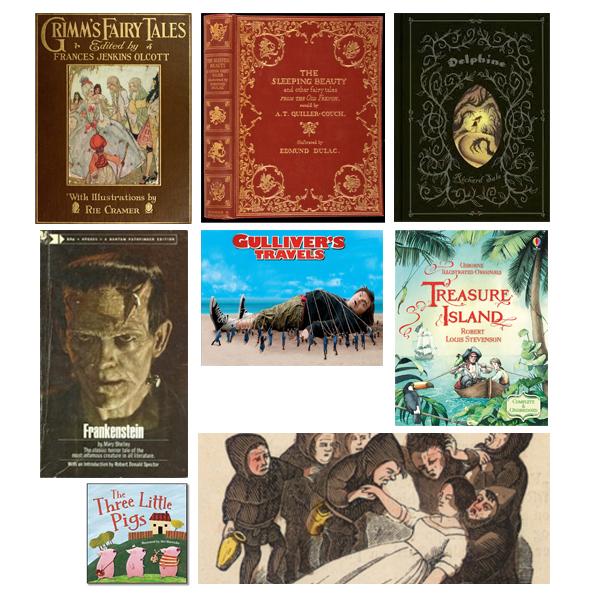 When Shelly suggested I consolidate these book covers under one article and share some of my thoughts and process for this particular challenge, I was more than happy to oblige. I have these 3 words written on my notice board at my work desk. I think this has always been the approach I take when I think of what photos to shoot, whether consciously or subconsciously. I am constantly trying to figure out how many other ways I can make my toy photo more unique. I have my client of 30 years to thank for this. She always asks me “Where’s the surprise?”, whenever I submit my visuals for her children drama classes. Taking something familiar and subverting it makes for an interesting image eg. taking a character’s trait and doing a 180. The Flash is fast, make him slow. C3P0 is timid, make him badass. Or taking the most mundane thing you can think of and put a toy there. The perspective changes immediately. Mashups are also another fun way to create unexpected and surprising images. It creates scenes that you will probably never see in the movies. Prior to this particular Literature theme challenge, I had a couple of concepts for some photos related to classic stories and nursery rhymes. So, when I saw the challenge, I already had the idea of the 3 Little Pigs in my note book from my side project. 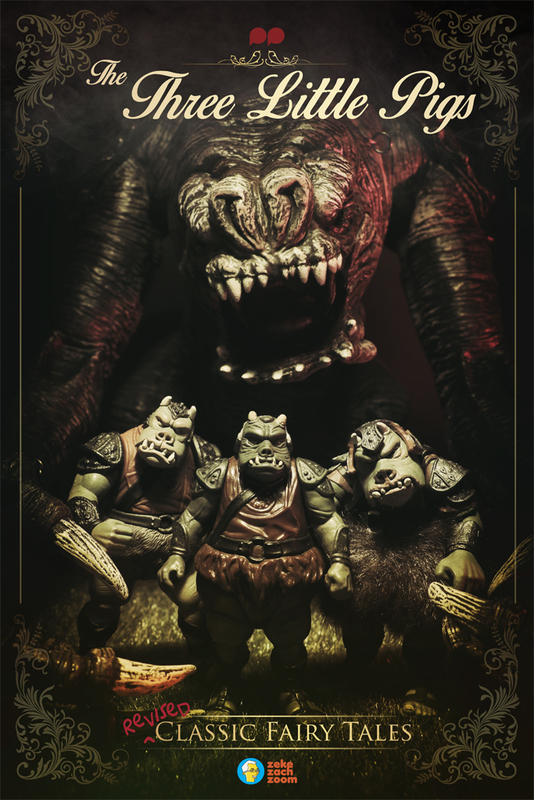 It’s no secret I love Star Wars, so it was natural that I used the Gamorrean Guards for the shot. They ARE pigs after all. The rancor as the big bad wolf was a natural choice. After posting the 3 little pigs, I had a flood of ideas. The basic approach for the rest of the ideas was almost the same. 1. 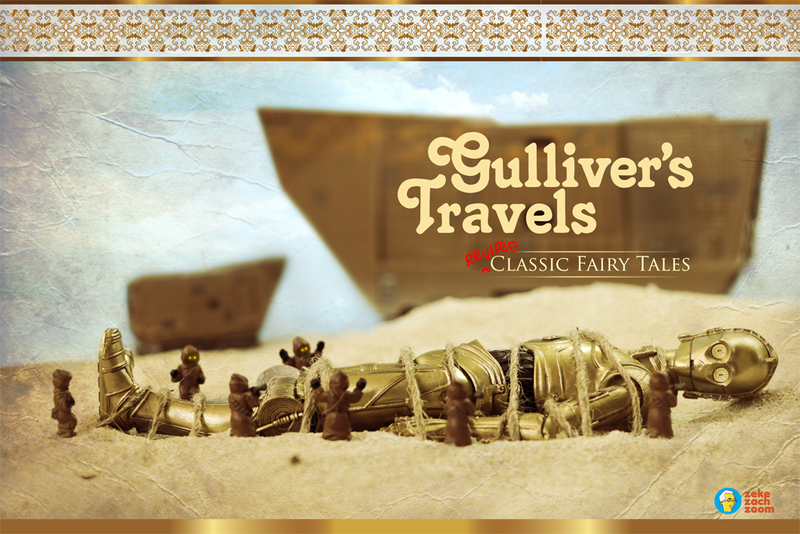 Google fairy tales / classic literature to choose a story and also to draw inspiration and ideas. Google is your friend. Use Google. 2. Substitute the main character with a toy that is not actually the character, but maybe share the same physical and character traits or story arc. 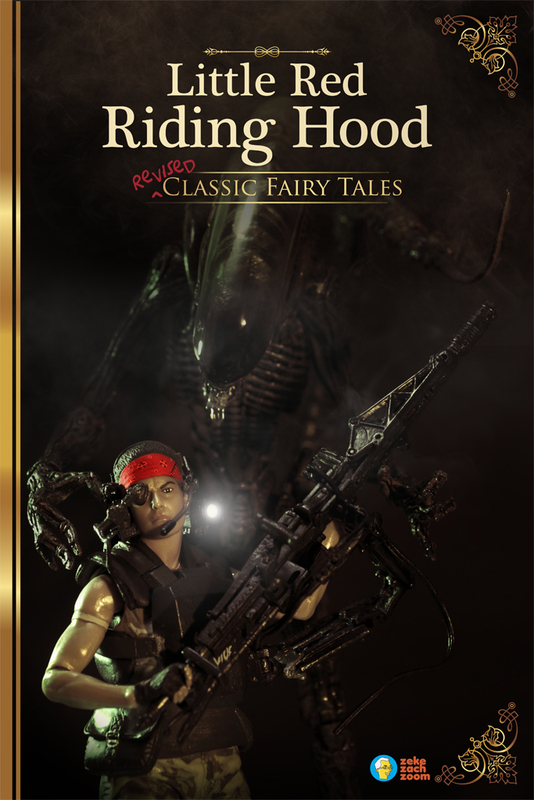 Actually, it works even better if everything that you know about the classic story is flipped around. The only thing similar to the original story is the color RED. The character I used for the shot is the direct opposite to the helpless protagonist. 3. I mentally run the whole Star Wars trilogy in my mind and pick the character I feel would be a good substitute. This is constrained by the number of figures I have of course. 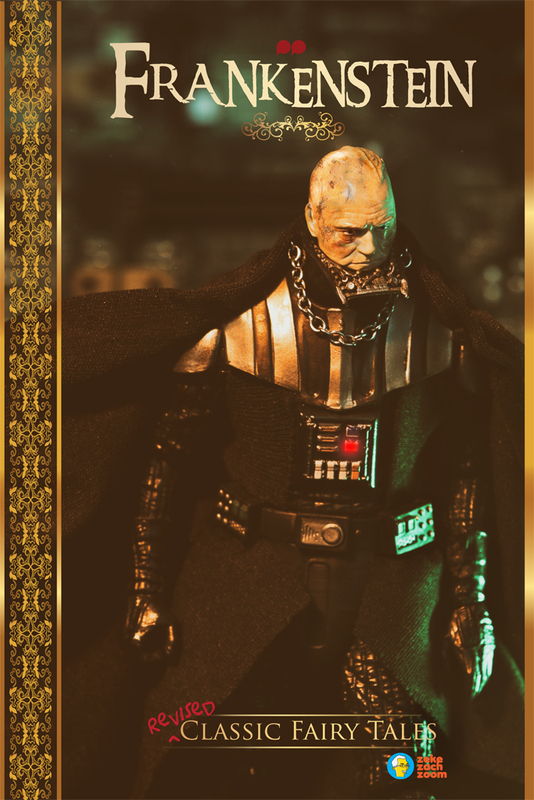 I do also think about my other non-Star Wars figures, as long as they fit the concept. The Jawas did capture 3P0, right? Also the macro machine figures are just the right scale for the job. 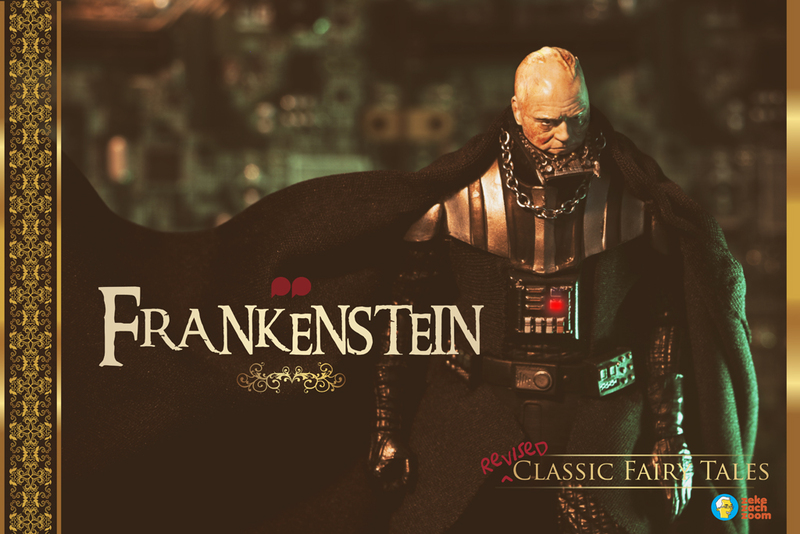 That infamous NOOOOOO scene inspired this Frankenstein shot. I am a graphic designer by day and I love typography. Doing up the titles for the photos was great fun and one thing lead to another and I went the whole hog and make it look like an actual book cover. The vintage framing gave the photo that right feel for the story, though, now that I look at it, the one without the frames and motif works just as well, but feels too modern, which was not the look I was seeking. Substituting Snow White and the dwarfs with these Star Wars characters was a no-brainer. 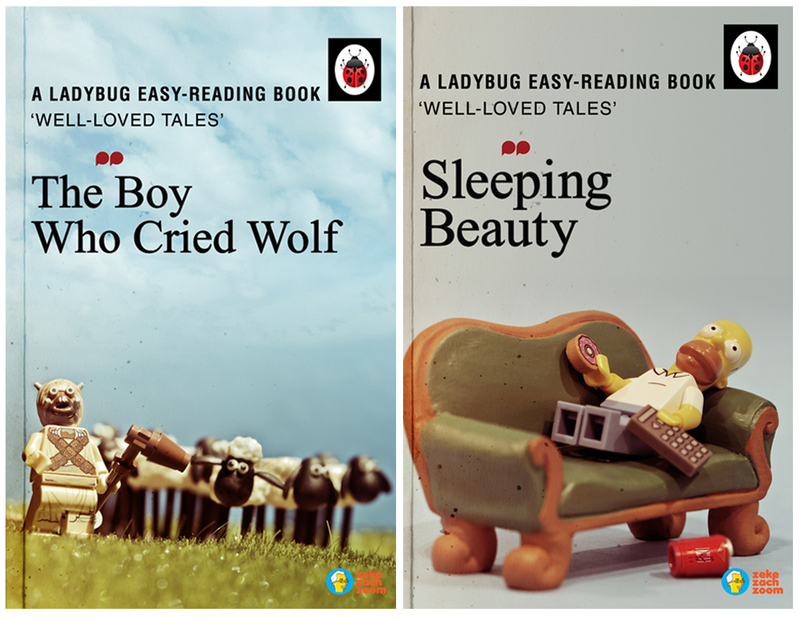 I had seen someone posted an article online of ladybird books for adults and I immediately fell in love with the concept. Taking what was so innocent and putting adult twist on it. I took the same concept and applied it to the toy challenge. I used the tusken raider for no other particular reason than it was one of my latest purchase and I just wanted to shoot him. However, a caption like “The sheep were more frightened of Timmy than the wolf” works for the figure used. Homer properly sleeps a lot (so, he’s an obvious choice) and is no beauty. I like that it’s working on a couple of level for this shot. Next PostThe best-laid plans of mice and meh! This is an awesome series. I love the way your brain works. You are rapidly becoming my favourite artist. Well done, sir. Well done. Thank you, Dave! I really had a ball making these pictures! I think my brain works the way it does is because of all the Mad magazine and comedy shows I watched while growing up! This was such a wonderful series Sunny. I really look forward to seeing the next ones. Thanks Brett! I had a blast making these and probably those that’s still inside my head that’s yet to be shot! Such a great series! Those Ladybird books are my favourites I think, but they are all excellent! Beautiful and inspired work Sunny! And so much fun! “Where is the surprise?” has to be my favorite question! I’ve written it down and hung it on my wall to remind me and inspire me as well. Thank you Sunny for sharing your thought process behind these images. I learned so much. “Subvert. Juxtaposition. Appropriation.” Is brilliant! !